Start monetizing your browser addon immediately by dropping in a snippet of code. 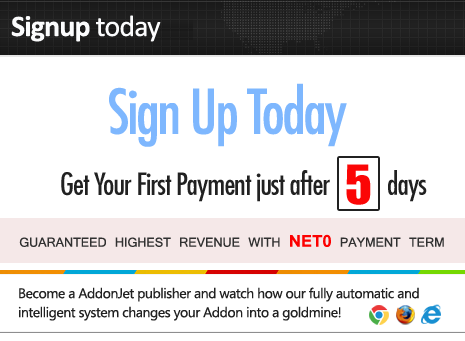 AddonJet is the Guaranteed highest paying ad network on the market specialized in Clean and safe New tab ads. New Tab ads are a great way to generate Highest revenue from worldwide traffic. We offer minimum 7$ per day per daily 1000 active users. CPM rates Depends on traffic quality. AddonJet Contextual Ads search program enables publishers to easily and effectively earn advertising revenue. AddonJet display relevant text ads consisting of sponsored links and ad topics. We aim to strike the right balance between relevance and revenue to deliver great performance. Addonjet makes it easier for publishers, broadcasters, and app developers to monetize their digital content across devices. We support high value video and in-web display formats, including native ad units With our Smart contextual in content video advertising. When using Addonjet, you are guaranteed to incorporate a safe, clean and respectable component into your extension. our services are completely transparent, giving you and the user the tools needed to understand where an ad originated and how to remove unsavory content.